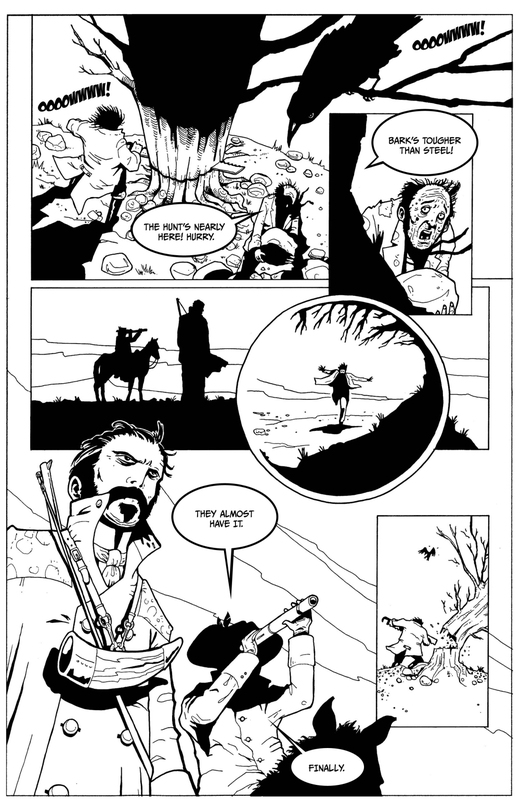 One of the last jobs I had to do as the script writer for Róisín Dubh issue 1 was check the text (dialogue balloons, captions, SFX) after all those elements have been laid down on the artwork. I found this a fascinating process because it brought home how much the dynamics of the artwork change the text itself. When designing their layouts artists always have to consider the placement of the balloons later on, but sometimes a great piece of art requires some finessing of the previous plan. Several artists have confessed to me that even if they are writing the dialogue themselves they sometimes forget to allow enough space for the dialogue. One writer/artist of my acquaintance told me of how he had to strip down a longish speech into a couple of lines because there was no usable space for the dialogue. Often these enforced re-writes can benefit the final product. Stephen Byrne did all the lettering for issue 1, and he made a number of wise decisions about the text. In one case he gave a line of dialogue its own panel, which lent the words more significance (it was originally two lines). He moved the previous line back into the earlier panel, and that worked fine. I spotted a couple of places where a line or two of dialogue had been omitted. In every case the dialogue was doing something for the story, and I pressed for them to be re-instated despite the confines of space. In one instance the panels were tight, but I knew the dialogue would add weight to the actions and give a sense of something happening ‘off-panel’. So, I re-wrote the dialogue, with an eye to paring it back to its essentials. I got two sentences down to two one-word sentences, and tightened up the rest. The result was much better and conveyed the urgency of the scene. In another instance I was concerned that a speech bubble was impinging too much on the art and concealing an action. I asked for a small move so that it was clear what was happening. Another artist friend showed me a place in his comic book where he had laid down a excellent sound effect to cover a piece of art he wasn’t too pleased with (in my experience many artists are perfectionists). That’s an instance where a judiciously-placed piece of SFX can come to your aid. SFX is another aspect of comics to which I’m paying more attention. As a reader its something that is part of the landscape of comic books, but as a writer it’s something you have to think about in a different fashion. I remember reading through a couple of panels and thinking “they sound too quiet”, which doesn’t make a lot of sense in some ways as everything is written down. Yet, a great piece of SFX can really bring a panel alive. I was just reading a comic in which the SFX word (THOOOM!) was the panel, with the art appeared inside the words. This kind of trick is particularly effective for superhero comics, and I filed it away for future use. Finally, there is a entire convention of bolding and italicising text that is completely different from what I would use when writing prose. In prose less is more. In comic books its use is dependent upon the style of the comic book, but word emphasis is much more common in this medium than in prose. It requires a certain change in mindset. One that’s not initially obvious when you’re writing the script on your own and dreaming up a blueprint for the artist. Once the artwork materialises the text must respond back to it, and sometimes that requires a number of unexpected changes. When everything is going well those tweaks are usually for the benefit of the final comic book. Róisín Dubh, volume 1, issue 1 is at the printers!